The biggest story with the Kpreps Week 3 rankings is that there is a new No. 1 in the Class 6A poll for the first time since November 9, 2015. Derby held the top spot for 19 consecutive ranking polls, but Friday’s 50-20 loss at Goddard drops the Panthers out of the top spot. The last team besides Derby to occupy the No. 1 spot in the Kpreps Class 6A poll was the Lawrence Lions. Shawnee Mission East takes over the top spot this week after a 41-0 win over Shawnee Mission Northwest. The Lancers have ridden a defense that has only given up six total points the first two week this season. The Lancers have a major test this week when they play Missouri-power Rockhurst at Shawnee Mission North Stadium. Lawrence Free State has risen to the No. 2 spot in the 6A poll after being unranked to start the season. The Firebirds have done so with dominating wins over Shawnee Mission West (56-9) and Shawnee Mission South (49-0). Free State will host Park Hill (Mo.) this week. Derby falls to No. 3 in this week’s poll, just ahead of Blue Valley North. The Mustangs also suffered their first defeat of the season, 28-14, to Class 5A No. 1 St. Thomas Aquinas. Topeka High remains in the poll at No. 5 after a 42-28 win over Junction City. Ky Thomas had another big night with 175 yards rushing with a score, and a 76-yard touchdown pass. The Trojans should get another challenge this week when they visit a solid Emporia team. St. Thomas Aquinas passed a big Eastern Kansas League test with the 28-14 win over Blue Valley North. The Saints rushed for more than 250 yards in the win, while holding the Mustangs to less than 20 yards on the ground. Things don’t get any easier for Aquinas this week as the Saints host the No. 1 team in Class 4A-I, Bishop Miege. Come late October we may look back on Goddard’s 50-20 win over two-time defending 6A champion Derby as the most impressive victories of the season. The second-ranked Lions dominated the Panthers in making a statement to the rest of Class 5A. Bishop Carroll remains in the No. 3 this week with a 48-24 win over Salina South. The Golden Eagles and Cougars met in the 5A playoffs for five consecutive seasons from 2011-2015, and the excitement level was high when the schools scheduled a regular season meeting the last two seasons. But Salina South has fallen on hard times in winning just one of its last thirteen games. St. James Academy stays at the No. 4 spot this week after a 38-26 win over Blue Valley Southwest. The Thunder was particularly impressive on the defensive side of the ball given the Southwest Timberwolves had scored 70 points the week before. The Jaguars of Mill Valley got back on the winning track with a 35-14 win over Blue Valley Northwest. They remain in the top five at No. 5 this week and will be on the road against the aforementioned Blue Valley Southwest Timberwolves this week. Bishop Miege remains atop the Class 4A-I poll after a 48-0 shutout of Gardner-Edgerton. The Stags have now outscored their opponents 103-10 this season. Miege will face a tough challenge this week as they visit Class 5A’s No. 1 team, St. Thomas Aquinas. For the second consecutive week, the No. 2 ranked team in 4A-I went down. Maize South now moves into the No. 2 spot after shutting out last week’s No. 2 McPherson. The Mavericks forced a safety and got a touchdown late in the first half to shutout the Bullpups, 9-0. McPherson drops two spots to No. 4 this week. De Soto climbs two spots to No. 3 in this week’s poll after an impressive 36-0 win over Bonner Springs. The Wildcats will get a tough Frontier League test this week as they visit Louisburg. Louisburg handed De Soto one of its two regular season losses a year ago. Finally, Buhler gets pushed down one spot to No. 5 in this week’s poll. The Crusaders picked up a 30-point win over Andover Central last week. The Crusaders travel to Class 4A-II No. 1 Wichita Collegiate this week. The top three spots in the Class 4A-II poll remain the same this week, but we have some movement at the bottom. Wichita Collegiate scored 21 unanswered points to top Hoisington on Friday night. With the win, the Spartans ended Hoisington’s 27-game regular season win streak. Collegiate will host Class 4A-I No. 5 Buhler this week. Topeka Hayden remains in the No. 2 spot this week. The Wildcats picked up their first win of the season with a 20-13 decision over Emporia. 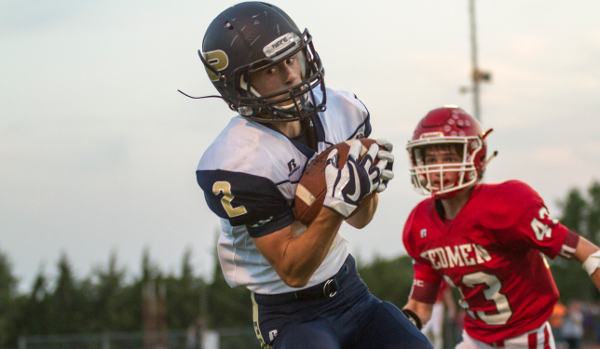 Hayden faces rival Seaman this week. Columbus stays at No. 3 after a solid road-win at Pawnee (Okla.). The Titans beat the run-heavy Black Bears 20-14, handing Pawnee its first loss of the season. Scott City and Pratt enter the rankings at No. 4 and No. 5, respectively. The Beavers knocked off last week’s No. 5 Holcomb, 23-14, while Holton fell 21-0 to Sabetha. Scott City travels to Cimarron this week, while Pratt has a big Central Kansas League showdown with Nickerson. There are no changes to this week’s Class 3A poll. Top-ranked Silver Lake didn’t play this week as their scheduled opponent, Wabaunsee, forfeited. Nemaha Central remains at No. 2 this week after a 55-14 win over Royal Valley. The Thunder host Holton this week. Phillipsburg remains in the No. 3 spot after an impressive 23-0 win over Class 2-1A No. 1 Smith Center. The Panthers will travel to Plainville this week. Fourth-ranked Conway Springs followed up their 98-point, Week 1 performance with a 60-0 blanking of Wichita Independent. The Cardinals will stay in the Central Plains League this week when they travel to Douglass. Finally, Marysville remains in the No. 5 spot this week after an impressive 43-20 win over Abilene. The Bulldogs snapped an eight-game losing streak to Abilene with the win. Smith Center remains on top of the 2-1A poll despite a 23-0 loss to Phillipsburg. Our voters didn’t punish the Redmen for a loss to one of the top teams in Class 3A. Smith Center trailed the Panthers 7-0 before Phillipsburg returned the second half kickoff for a touchdown. Jefferson County North remains in the No. 2 spot this week after the Chargers cruised to a 50-6 win over Maranatha Academy. The Chargers will host Pleasant Ridge this week. Lyndon moves up a spot in this week’s poll to No. 3. The Tigers cruised to a 48-6 win over Mission Valley and will host Central Heights this week. Valley Heights moved up to No. 4 this week with a 60-20 win over Doniphan West. The Mustangs have scored 119 points in two games this season. Finally, the Ell-Saline Cardinals enter the poll at No. 5 this week. Ell-Saline opened with a 10-point win over then No. 5 Sedgwick, and followed that up with a 35-7 win over Whitewater-Remington. The Cardinals, who return a lot of experience up front on the offensive/defensive lines, will host Heart of America League rival Moundridge this week. Class 8M-I could be in the consideration with Class 3A as the deepest classification in Kansas as far as the number of quality teams. This week’s top five doesn’t change as all five teams cruised to big wins. Top-ranked St. Francis played just one half in beating Triplains-Brewster 56-0, while No. 2 Osborne had little trouble with Beloit St. John’s-Tipton in a 48-0 rout. Burlingame remains in the third spot after the Bearcats beat Hartford 60-8. The Bearcats will be on the road at Lebo this week. Spearville had the biggest test last week, but the Royal Lancers passes with flying colors. Spearville beat then 8M-II No. 3 Hodgeman County, 64-34. Finally, No. 5 Victoria followed up their big Week 1 win over Central Plains with a 60-12 rout of Macksville. Hanover continues to be the top team in 8M-II. The Wildcats defeated Udall 54-6 in a neutral site game played in Salina. Hanover will travel to Southern Coffey County this week before getting into Twin Valley League play in Week 4. Pike Valley remains ranked No. 2 this week. The Panthers rolled to a 62-14 win over Thunder Ridge. Pike Valley travels to Stockton this week with the Tigers still looking for their first win. Hodgeman County’s loss to Spearville means there is some shake-up at the bottom of the poll this week. The Longhorns drop a couple of spots to No. 5 in this week’s poll after their 30-point loss to the Lancers. Otis-Bison moves up a spot to No. 3 this week. The Cougars rolled to a 56-0 win over Ellinwood and amazingly, scored all 56 points in the first quarter. Hutchinson Central Christian moves up a spot to No. 4 this week. This set of Cougars cruised to a 66-12 win over Pratt-Skyline. Central Christian has scored 156 points in its first two games this season, two points behind Conway Springs for the most in the state.